One day I was so pumped up on hunger during the pregnancy, I made my husband take me to the MN State Fair just so I could taste the tangy yumminess that is Fried Green Tomatoes. Not only did the vendor confirm me as his best customer ever (owing to the copious amounts I ate) but it inspired me to make my own version of Fried Green Tomatoes at home. Today, I did just that. I’ve made mine spicier and crispier than the traditional recipe. I’ve added 3 different types of spices to add just the type of spice that goes with the tanginess of the tomatoes, and I also used panko breadcrumbs for extra crunch. I suggest you use heirloom green tomatoes if you can find them, as they are larger and have more flavor (I bought mine from the Minneapolis Farmer’s market). I serve the crunchy tomatoes with seasoned sour cream and mango habanero sauce, but you could use any dip or condiment you like. In the mean time, put out 3 medium size bowls. Fill one with flour and season it with salt, pepper, a dash of chili flakes, 1/2 tsp paprika and 1/2 tsp cayenne pepper. Once some of the juices have come out of the tomatoes, start with preparing them for frying. Dip in the egg wash, then the flour, and then the bread crumbs. Place flat on a plate in one layer and allow the slices to refrigerate for 15-20 minutes. Allow to drain on paper towels. Serve with seasoned sour cream (salt, pepper, lemon juice) or my favorite – mango habanero sauce. Wow. Never had this before but I certainly know I would love it. Yup, surely give it a try if you can get green tomatoes. Look for hard tomatoes that will stand the seasoning and frying process. yum if you don’t grow tomatoes in your garden where would you find green tomatoes? Thanks for visiting my blog, Patty! You should find green tomatoes at any specialty grocery store. However, they are not at all expensive. Your local farmers market should also have them. Look for hard tomatoes that tend to have lesser water in them. Had veg sliders with these fried green and red tomato patties in it. Loved the idea! I haven’t heard of this before. Would love to try it if I can lay my hands on some Green tomatoes..first. Hi Anita! 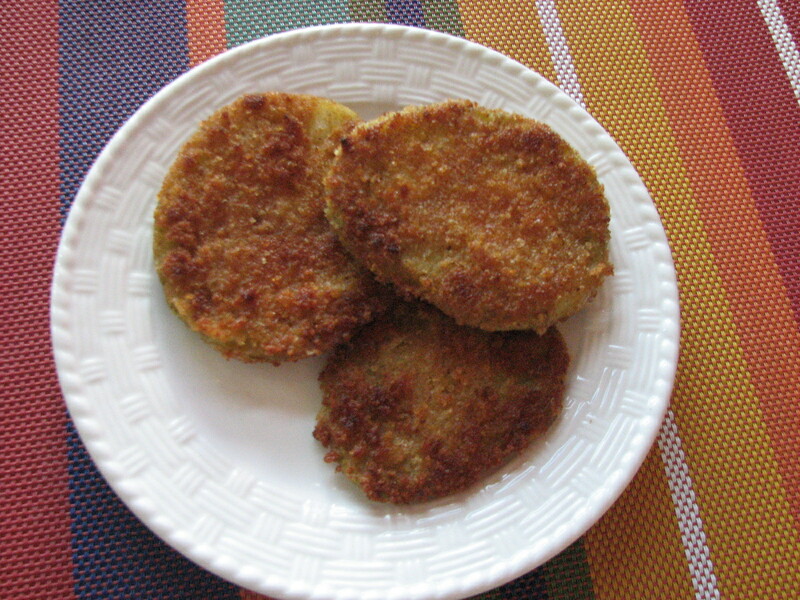 Yes, fried green tomatoes are a common appetizer here in the US and are a southern specialty. 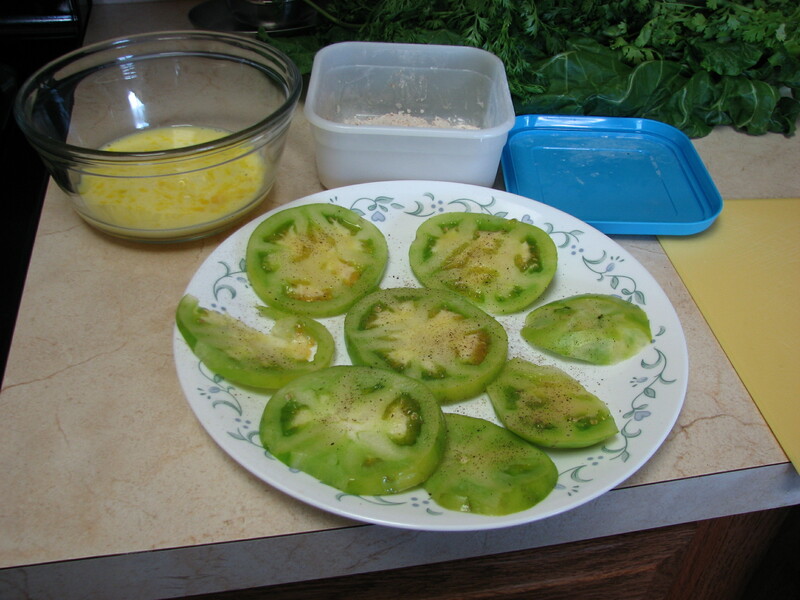 The southerners actually soak the tomatoes in buttermilk instead of doing an egg wash. Also, they use cornmeal for crunch, instead of bread crumbs. Look for hard tomatoes that are not soft and watery when sliced. They should work if you cannot find the real green tomatoes. 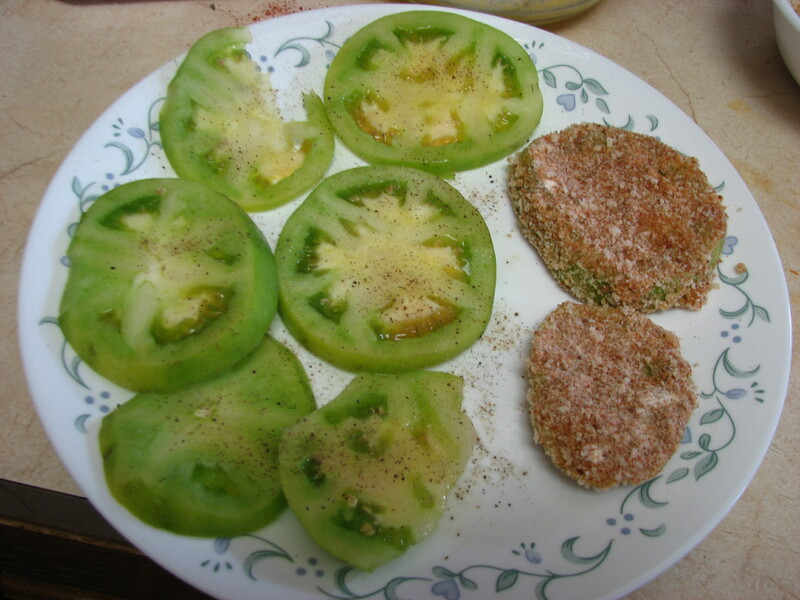 Love fried green tomatoes.I like to eat them with tomatillo salsa- double fun 🙂 Look yummy! Thank you so much for trying my sister’s recipe, Shubhangi 🙂 So glad you liked it! Had veg sliders with these fried green and red tomato patties in it. Liked the concept! They weren’t as spicy but I’m absolutely sure these will be with cayenne and black pepper. Loving it.